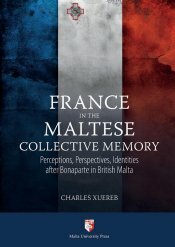 Malta University Press has just launched a new book entitled France in the Maltese Collective Memory, Perspectives, Perceptions, Identities after Bonaparte in British Malta by Charles Xuereb. The book represents the thesis the author presented for his Ph.D. at the Institute of Maltese Studies of the University of Malta. Retrieving memories from the French interlude of 1798-1800 the author presents current academic theories of collective memory and researched documents – some for the first time – in Malta, Paris, London and Italy to argue the case for Malta’s identity as perceived by different generations from various perspectives. Dr. Xuereb challenges the veracity of what Maltese history has been saying for the past 200 years about this crucial event and the British period that followed, provoking a debate by investigating and analyzing new perspectives and arguments. During the launch held at the Auberge de Provence, the only Auberge of the French Knights of the Order of St John still standing in Valletta politicians, diplomats and academics joined to speak about the book. 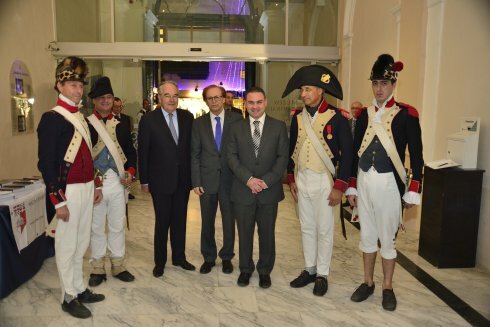 A number of Re-Enactment soldiers and civilians from the French period were present and entertained the distinguished guests with period chansons de l’Armée during a champagne reception. A section of the distinguished audience including from right, the Ambassador of Italy, Ms Vandepoorter, the Ambassador of Turkey and the Ambassador of Egypt. The audience at the Auberge de Provence includes a number of leading Maltese academics. Maltese Minister of Culture Owen Bonnici addressed the distinguished audience about Malta's multicultural identity and how today as "Minister of Culture I am aware not only of the numerous artistic activities that the country is committed to all year round but also of the ingredients that make us think the way we do about all those things – artistic or otherwise – that make us Maltese, Mediterranean and European. From left: Prof A Aquilina, the Ambassador of France in Malta, leading Maltese historian Prof Henry Frendo, Maltese Minsiter of Culture and the author Charles Xuereb. The Ambassador of France in Malta, M. Michel Vandepoorter highlighted various approaches of the author's analysis of Malta's past history and referred to how the French interlude has been 'misjudged' for far too long. He hoped the book will further consolidate the Island's relations in many aspects including tourism with some 120,000 French tourists choosing Malta annually. From left HE the French Ambassador, M. Michel Vandepoorter, the author, Charles Xuereb, and Maltese Minister of Culture Owen Bonnici. Professor Anthony Aquilina from the Department of Translation, Terminology and Interpreting Studies of the Faculty of Arts at the University of Malta welcomed Xuereb’s publication asa breath of fresh air regarding the period 1798-1800. He said that correcting false impressions and perceptions through painstaking and investigative research, as Dr Xuereb did, is of the utmost importance. “In the absence of authentic testimony by the Maltese peasant protagonists, albeit manipulated by ecclesiastics to rise against the new liberal rulers only ten weeks after their arrival, Xuereb patiently sifted through it all, decomposing and recomposing it along the way, until he could handsomely make up for the deafening silence”. Dr Xuereb concluded with a visual presentation tracking some of the main events under the French and the British colonial period. He backed his arguments with various facts as illustrated not only in history books but also in the public space of Malta’s capital Valletta where remembering and forgetting was manipulated in such a way that it produced a distorted collective memory. The author pointed out that Maltese citizens today suffer from a historical malady that tends to remember misinterpreted aspects of its colonial past more than its authentic history. Malteseness, for example, is conspicuously absent from the numerous Valletta monuments and memorials. appearing for the first time. at the price of Euro 40.